Even though I still adore making them, cupcakes are getting a little tired as King of party foods. I thought that macarons might have given them a run for their money (see article here), but they aren't the easiest thing to make. 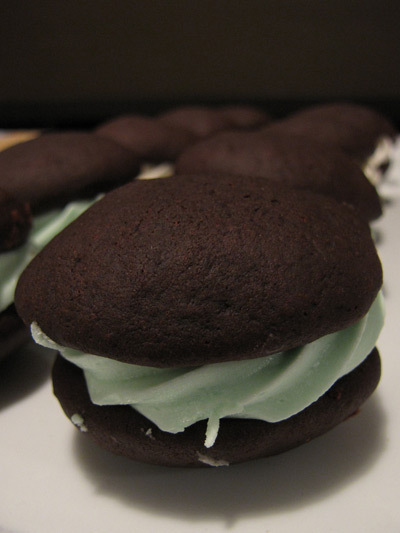 But I am quite excited about a new (for us Aussies) potential party food winner.... the whoopie pie. Whoopie pies are an old fashioned treat in the New England and Pennsylvania areas of the US and are essentially a cake cookie - vanilla cream filling sandwiched in a fluffy chocolate (or sweet spiced pumpkin) cake bun. Less fiddly than a cupcake, and a lot easier to make than a macaron, the whoopie pie has a more rustic, handmade look. I can imagine a huge heaping pile of them being wolfed down at a kids party, or different flavours perched casually on a cupcake stand. And maybe some spiked cream whoopie pies for the adults. Totally droolworthy, and doable! I've been seeing whoopie pies everywhere online. And a quick search shows an article from the New York Times last year proclaiming "Whoopie! Cookie, Pie or Cake, It's Having Its Moment". Whoopie pies were believed to have orginated in Pennsylvania, where they were baked by Amish women for farmers’ lunchboxes (who proclaimed Whoopie! upon finding them). Here are a few recipes on Taste.com.au and Epicurious for whoopie pies using a marshmallow filling but I'm more tempted by this buttercream filling recipe from The New York Times. You can buy a Whoopie Pie packaged mix and cooking pan from Williams Sonoma in the US (as well as several other large US kitchen supply stores). And here is a great article from Not Quite Nigella about them. I can't wait to make them. Have you tried them? Or made them? I use to buy these at the supermarket years ago and then they just stopped making them. Totally didn't know they were whoopie pies. I'll have to try them next time we go to town. Yum!! Nice spotting - I was also getting over the cupcake momentum! I reckon my kids would shout 'whoppie' over these too... will test them out for Sam's birthday. Wow, Whoopie Pies look delicious! I am also a bit over cup cakes. I think I'll give these a go on the weekend. Thanks for sharing them!